After much experimentation, I finally bring to you my recipe for vegan snickerdoodles. These vegan snickerdoodles are soft, chewy, and a tiny bit tangy, just like their non-vegan counterparts. All without butter or margarine, commercial egg replacer, or other processed vegan alternatives. Crispy on the edges, rich and chewy in the center – what more can you ask from this classic cinnamon sugar-dusted cookie? Instead, a base of coconut oil with just a touch of vegetable oil gives these vegan snickerdoodles their buttery texture. Because ‘chewy’ is one of the most important traits I seek in a cookie, I also used some brown sugar (which is not a traditional snickerdoodle ingredient, but aids chewiness in this vegan version). These cookies have delighted dozens of non-vegans, so you can bring them to your mixed holiday gathering or bake sale with confidence! New and improved in 2017! 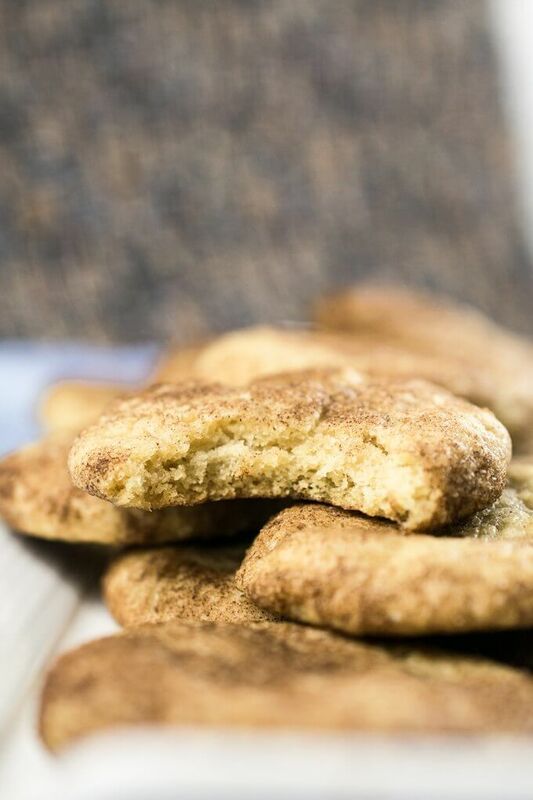 This post was originally published in 2015, but I’ve made 10 batches of these dairy-free snickerdoodles this fall in an effort to make the recipe even more foolproof and delicious. Your eggless snickerdoodles will now come out perfect every time thanks to weight measurements for the ingredients. Bonus, this updated recipe actually has LESS oil and LESS sugar than the original. It’s a win-win-win! Of course, the biggest struggle with veganizing cookie recipes is the egg. I don’t usually care for the cakey texture introduced by applesauce, and while I love the use of flax “egg” in my vegan oatmeal raisin cookies, the nutty flavor of flax can be overpowering in more delicate cookies like snickerdoodles. Luckily, as you may know, aquafaba (bean cooking liquid) has transformed vegan cooking and baking, with its protein and starch content making an excellent stand-in for eggs in some applications. Using it is as easy as opening a can (I recommend BPA-free) of chickpeas and straining out the liquid. You absolutely cannot taste any trace of bean flavor in the final product. Btw, NO whipping is needed here like it is for meringue. The aquafaba gets creamed together with the oils and sugar, so you don’t need to learn any fancy techniques, just mix it in! 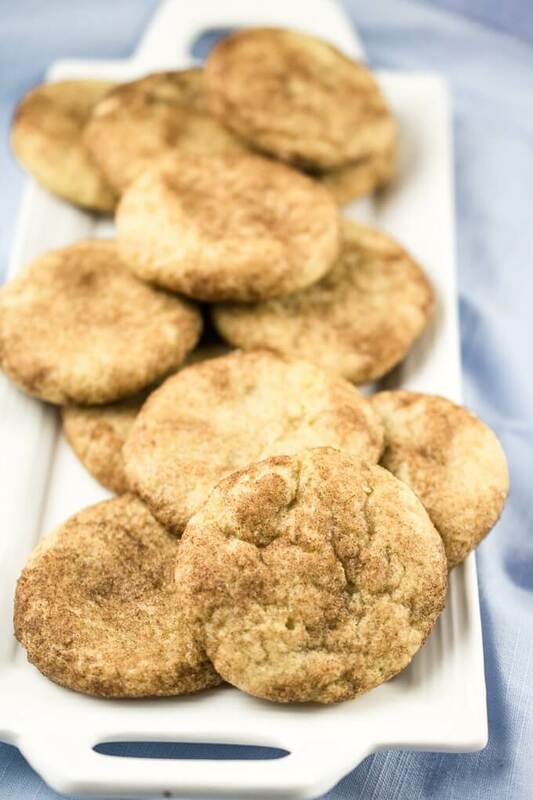 The aquafaba in this vegan snickerdoodle recipe makes the cookies chewy while also keeping them tender and moist. I had been living a life deprived of good vegan snickerdoodles, but no longer! Are these egg-free snickerdoodles healthy? Nope! But they’re perfectly delicious! If you give them a try, let me know in the comments or share your results with me on Instagram by tagging @yupitsvegan and #yupitsvegan! Vegan snickerdoodles without any fancy ingredients or frills. Crispy, chewy, tender, and rolled in cinnamon sugar! The dough needs to rest for a little while, so plan ahead. 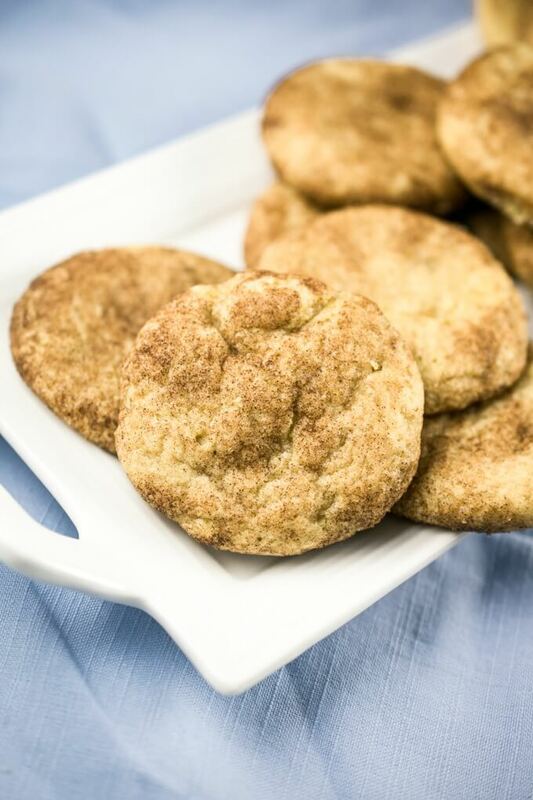 No applesauce, no banana, no weird texture, just classic vegan snickerdoodles! In a mixing bowl, cream together the coconut oil and vegetable oil along with both types of sugar and the aquafaba. If you don't have an electric mixer you can whip the ingredients vigorously with a fork. Mix until smoothly combined; using a fork this may take several minutes. Add the non-dairy milk, vinegar, and vanilla extract and mix until combined. Add the baking soda, cream of tartar, and sea salt, and continue mixing until smoothly combined. Add the flour and mix just until the flour is smoothly incorporated. Cover the dough and refrigerate for at least one hour (but preferably, for best results and the least spreading, 2 to 4 hours of chilling). Preheat the oven to 350 degrees Fahrenheit and line a baking sheet with parchment paper or a Silpat (you may need 2 baking sheets, depending on their size). Mix together the sugar and cinnamon for the topping in a small bowl. One at a time, scoop a heaping tablespoon of the dough, roll it in the cinnamon sugar mixture, and place it on the baking sheet, flattening it slightly and leaving about an inch in between cookies for them to spread. Bake for 11-13 minutes, or just until the edges start to turn golden. Let cool for a couple of minutes before removing from the baking sheet and transferring to a cooling rack to cool down completely. Store leftover cookies in an airtight container at room temperature for a few days. WHAT IS AQUAFABA? : Aquafaba is the cooking liquid from beans. For this recipe, white bean or chickpea aquafaba is recommended because of the color. I used liquid measured from a BPA-free can of white beans. ROOM TEMPERATURE: I'm not joking around when I tell you to have your non-dairy milk and aquafaba at room temperature. If they're still cold, warm them gently for a few seconds in the microwave. Cold soy milk will cause the coconut oil to solidify into pieces and make it impossible to cream it properly with the coconut oil. And then your cookies will come out weird. Sad! MEASUREMENTS IN GRAMS? 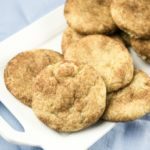 : You'll have much more consistent results with these vegan snickerdoodles and my other baking recipes if you measure by weight. Weight measurements are more precise than volumetric measurements for many types of ingredients. Get yourself a $10 kitchen scale and become a more awesome chef! 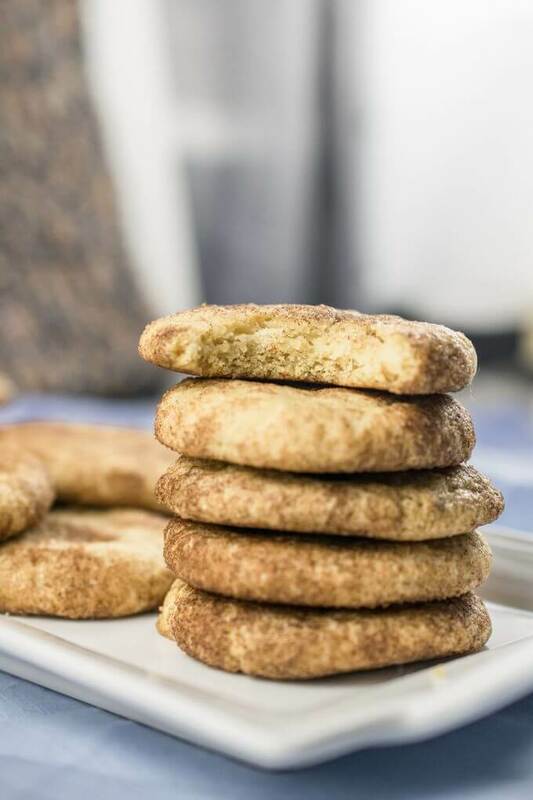 COCONUT OIL: You can use virgin coconut oil, but note your snickerdoodles will have a coconut flavor. Don't substitute vegetable oil for the coconut oil or vice versa. You won't be happy with the outcome. RECIPE UPDATES: Improved in 2017 with adjusted oil and sugar quantities to guard against the cookies spreading, and improve the crinkly tops. I've also swapped cane sugar for turbinado sugar, as the cane sugar emulsifies better with the oils. Enjoy! GLUTEN-FREE: I recently tried to make these gluten-free by substituting all-purpose gluten-free flour by weight for the all-purpose flour. It was a hot mess. The cookies spread everywhere and had a crumbly texture. I'm going back to the drawing board on a gluten-free version! Any progress on the GF Veronica of this or any of your other baking recipes? These look excellent but my body really can’t handle the gluten. Thank you! Love the Aquafina revelation! Yeah, gluten-free flour was a hot mess… I tried making it with coconut flour. Lets just say you needed a glass of milk next to you while eating them… Also couldnt really flatten then- snicker balls instead of cookies lol! I decided to withhold my comment until after my third attempt to ensure these were truly foolproof, and they really are! My first two attempts returned super authentic looking crinkly top snickerdoodles, while number three I opted for no cinnamon sugar dusting and came out with amazing sugar cookies. For what it’s worth, I’ve used aquafaba from chickpeas, cannelinni beans, and great northern beans with indistinguishable difference – if using liquid from a can make sure there is no (or very little) added salt. I made these cookies and I’m sorry to say, I was disappointed. My cookies didn’t look like the cookies in the picture. They spread out and were thin on the borders. The dough was in the refrigerator over night. The coconut oil I used was rather firm, but it smoothed out very well in the mixer, it looked great. The taste was good, but not quite as good as the recipe from The Viet Vegan. The cookie from that recipe looks exactly like a snickerdoodle cookie, but does not have the softness of the “regular” cookie. I was so hoping this recipe would be more authentic. I’ll try it again with the white bean aqua faba. Thank you so much! Would it still come out alright if you make the dough ahead of time and bake them a few days later if the dough is kept in the fridge? Hi Sophia, I”ve made this dough up to 36 hours in advance in the past and had good results. I haven’t tried for longer but I’m assuming that would be fine. I made these a few weeks ago and can’t stop thinking about them, so good! Do you think it would be ok to freeze the dough? I think this dough should freeze well! Thanks for your comment and sorry if the sugar terms are confusing! Brown sugar = white sugar + molasses (here it’s sold in “light” and “dark” varieties depending on the amount of molasses; I call for “light” here but I imagine dark would also work if that’s the only option). Hope this helps! I use the term “cane sugar” because in the USA, if you look for that term on the label you’re more likely to find a vegan brand. This was my first try at an aquafaba recipe and I was really pleased at how well they turned out! Just like “real” snickerdoodles! I think I may have flattened them too much before baking as they came out pretty flat after bakikng, but still delicious! These cookies were awesome. I added more flour because I failed to see the dough needed to be refrigerated and I thought it was too thin then I saw to re-fridge anyhow my cookies came out plump and nice. THESE ARE SO GOOD! THEY CAME OUT PERFECTLY!!!!! Thank you! Can gluten free flour be successfully substituted? I haven’t tried these with gluten-free flour so I’m not certain, but I think there’s a good chance it would work. They are more indulgent than I’d usually bake in terms of sugar and oil, but man so worth it for a special treat!! Hi, I’ve been vegan about 18 months and made these cookies a few days ago. They are absolutely the most delicious cookies, and even my anti-vegan mother would not know they are vegan, they are so delicious. But I have a question: when you say “room temperature coconut oil” do you mean melted or solid? Because depending on the outside temp my coconut oil can be either. When I saw that you could whip the oil with the sugar using a fork I assumed you meant melted, but maybe this is why my cookies turned out pancake flat instead of fluffy like yours in your photos. Still delicious, just flat. Thanks again for a great recipe! I’m planning to make more today. Hi Laura, thanks for your feedback (and glad you enjoyed the cookies nonetheless!) – the oil should be soft enough to work with, but not liquid. Like the texture of softened butter. I’m updating the recipe now to be more clear. If the batter still comes out on the thin side you can add a bit of extra flour at the end. The humidity levels and other factors can also affect the moisture of the dough. Thank you so much for clarifying! I will try again with solid (but soft) coconut oil. Okay, I have made these cookies 5 more times since I posted my initial review. Yes, they are THAT delicious! While I still have not been able to achieve the fluffiness shown in your photos, it seems like using aquafaba from garbanzo beans yields flatter cookies. The 3 times I’ve used white bean aquafaba my cookies have been noticeably less flat. Thanks so much for this great recipe. These have become my favorite cookies, and I use every excuse to make another batch. Laura, I’m totally stoked that you love the cookies so much! I have recently also learned that different brands and types of aquafaba can affect the texture too. I used aquafaba from a can of white beans the time that I photographed these, and I do remember it being especially thick that time. I’m planning to update this recipe soon with weight measurements for the flour and sugar so that results can be more consistent. Your feedback is so appreciated! Sorry, but I’m not sure! I don’t think nutritional analysis on aquafaba has been fully completed yet. I made these the other day and they came out exactly as promised. chewy and delicious. will make a gain. Thanks! Where is the vinegar used in the recipe? Is it mixed with the x-milk? I’m sorry for the omission! It’s added with the vanilla extract and aquafaba. I fixed the recipe, thanks for pointing that out. Finally. For me this is both emotional and nutritional revelation. My mother (passed 2 yrs ago at 96) would back Snicker Doodle for me on all my special occasions, and best of all, send them to college some 40 years ago. Turning vegan in 2012 deprived me of these delicacies. I can’t wait to make these this weekend.